A fresh group of eight takes us through Europe and ends in Africa, highlighting both sublime city locales and island paradises. After all, life is about balance. And exceptional hotels. 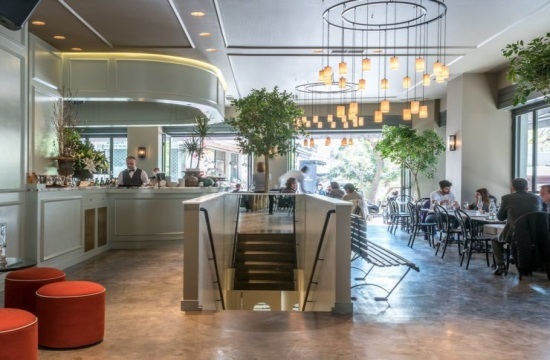 Just opened in the wonderful Greek capital city of Athens, Perianth Hotel is a neo-modernist marvel in Agia Eirini, a lovely Byzantine-era square near many of the city's major attractions. A focus on contemporary Greek art and design means an abundance of local artists are on display, as is the city's buzzy cultural scene. A short hop to Santorini island, the idyllic enclave of Istoria awaits, a high-luxury affair designed by the Athens-based Interior Design Laboratorium. Here, steps from the black volcanic shores of the southern east coast, a world of simplicity and rural respite reigns. Staying on Santorini, this time on the north western shores, the three-room Vora's cliffside setting is as impressive as it is private. Greek design stars K-Studio (also behind the design of Perianth Hotel and Scorpios) have used sleek Cycladic aesthetics to offset the ruff-and-tumble rocky surroundings. Hopping islands, the port of Zakynthos island beckons with the opening of Olea All Suite Hotel & Spa. Among 93 luxury suites, a meandering river-like water feature runs through the property both conceptually and physically. Leaving the eternal sunshine of Greece, next up is the thriving student city of Göttingen, Germany. The newly opened Hotel Freigeist Göttingen is located in the heart of a new district—creating a hub for artists, world travelers, and perennial students of life. Once home to a cheese, fur, and leather-trading company, the newly transformed Spedition in Thun, Switzerland, is a contemporary nod to Old World tradition. The building housing the 15-room hotel is more than 1oo years old and has been designed by Design Stylt Trampoli AB—taking its inspiration from a patrician villa. Should the cooler winter climes of Europe necessitate an escape plan, central Africa is answering the call. In Gigiri, a verdant residential suburb in the north of Kenya's capital city Nairobi, the Trademark Hotel is a hive of public spaces and modern African design. For those seeking some of the best beaches anywhere in the planet, Zuri Zanzibar—the first Design Hotels™ member on the Tanzanian archipelago—is the ultimate spot to take in the natural beauty of the island. 55 villas and bungalows peer from curtains of lush greenery while Indian Ocean sunsets steal the spotlight.